I've been having a slower couple of weeks which is super unheard of for me. I've been able to sleep in, see friends, cook new foods I have wanted to try, watch trashy TV (The Bach mainly haha!) and work just a few hours a day in between it all. It's been such a nice change from my usual 12 or so hour work days. I'll try to stay a little more balanced now that work is ramping up again, because it's actually really nice to stop and smell the coffee, you know? The down time has also allowed me to finally get the ball rolling on some changes I've been sitting on the fence about all year and I am really excited to share them soon! 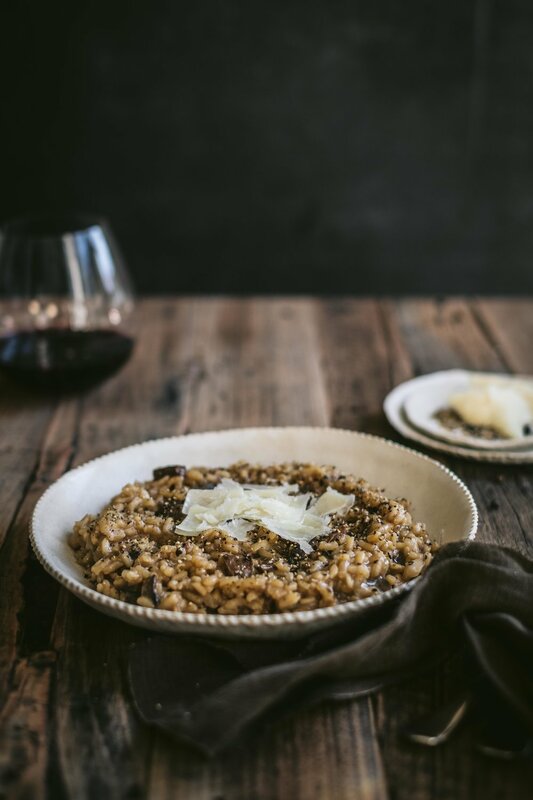 In the meantime, I'm sharing my mushroom risotto recipe because every single time I put this on my stories, you guys go bananas! I use a LOT of mushrooms because they cook down to nothing, kinda like spinach, and I love them! 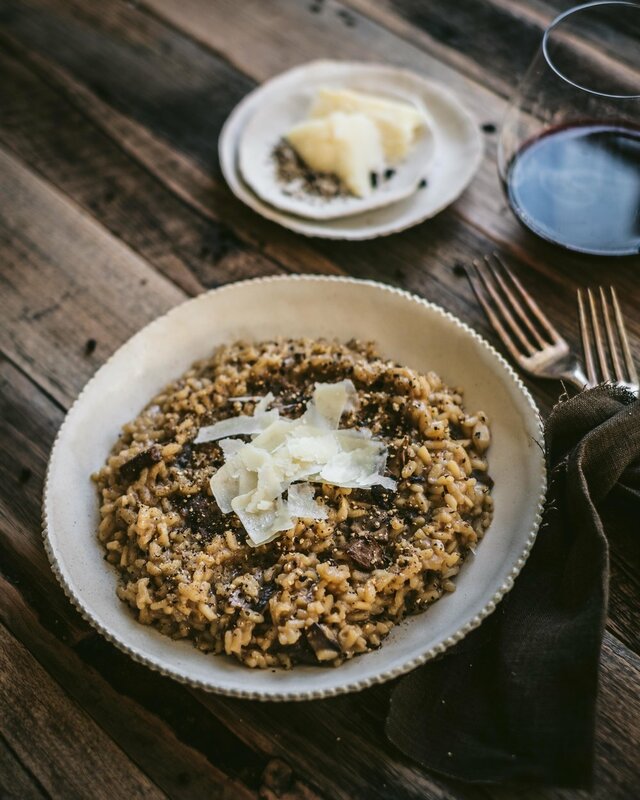 I like using cannarolo rice but this isn't available at every supermarket so you can use arborio rice too. I'd like to add that the wine seems like a lot but all the alcohol cooks out and it provides such a beautiful flavour when it's all finished that I really really wouldn't want you to leave it out! This recipe serves four generously and can be kept in the fridge overnight for lunch the next day, but I doubt you'll have leftovers! Heat 1 slug of olive oil in a non-stick pan over medium-high heat. Add mushrooms and cook until they are browned and beginning to crisp up, turning over every couple of minutes. Set aside. Heat the stock in a saucepan over medium heat until almost boiling. Then reduce heat to the lowest it can go to keep hot with a lid on. In a large heavy-based pot, add the remaining slug of olive oil and add onion and garlic, cook on a medium heat until onions are translucent. Add cooked mushrooms. If you have some browning left on the mushroom pan, you'll want to use it because that is the flavour! Add a little stock to the pan to deglaze it then pour it back into your stock pot. Add the rice and cook on a low heat for 2-3 minutes until the ends of the grains of rice are beginning to look translucent. Add the wine and cook until wine has evaporated. Repeat with the remaining stock until the rice is tender with just a slight bite, like 'al dente' pasta. Season with salt and pepper to taste then serve with parmesan cheese.